Hello my darlings! Happy BLOGmas Day 2! In my weight loss journey, people often ask me what I eat regularly. I've never done a post dedicated to my go-to meals. So, for today, I figured I'd share some typical meals that I eat at home. I know the holidays are coming up and we're all going to gain some weight (workout post coming tomorrow though, so eat up!). In the meantime, here are some healthy meals you can have at home (or draw inspiration from) in between your feast days (or just on regular days, like after New Years lol). Disclaimer: I ain't no chef...so...ya know. This is a very common breakfast for me. In fact, this is my go-to more often than not. 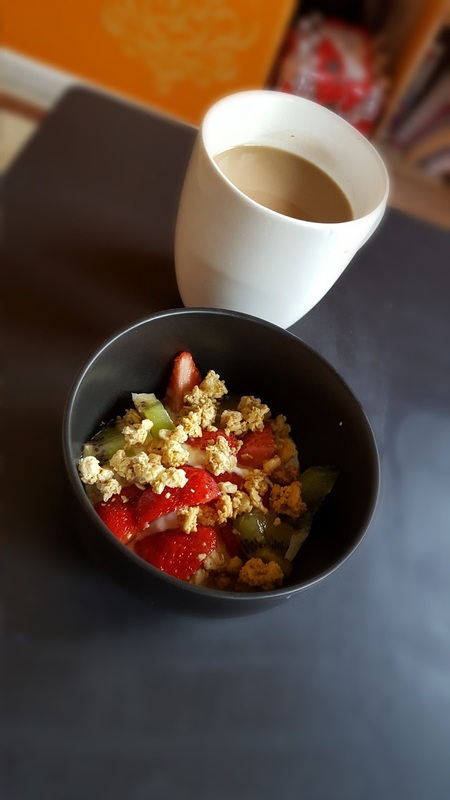 Honey strawberry Greek yogurt, granola, strawberries & kiwi with a drizzle of honey. Plus a chai tea! The Greek yogurt provides some good probiotics for digestive health, the granola gives me some fiber, as well as the fruit. The drizzle of honey is for good luck (at least in my mind) and sweetness. This next one is another typical breakfast of mine. I make this when I have a few extra minutes to spare and I feel like cooking a little bit. 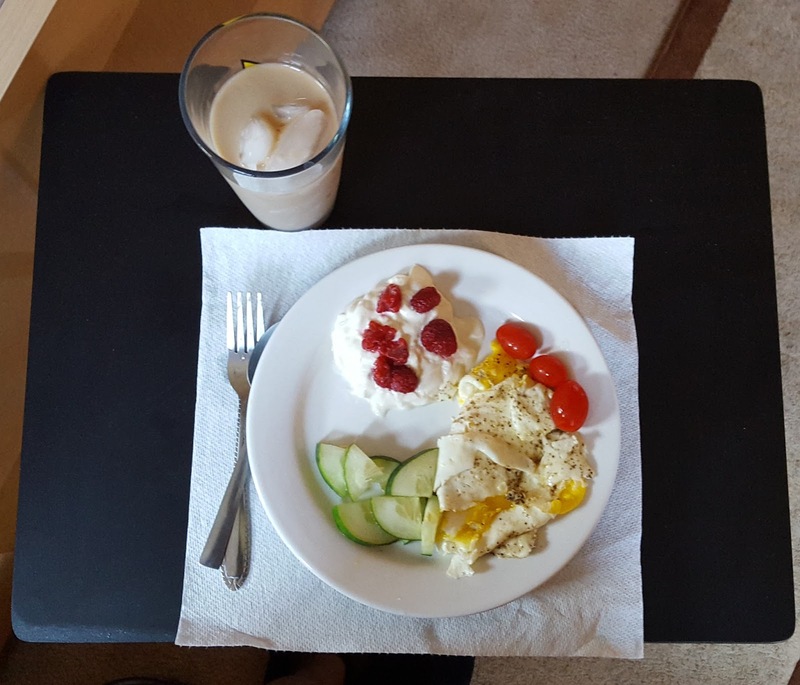 Eggs, cherry tomatoes, cucumber, and Greek yogurt with raspberries. Plus an iced chai. And finally, this is for when I have a bit more spare time, usually on the weekend. Pro tip: sriracha is amazing on EVERYTHING. 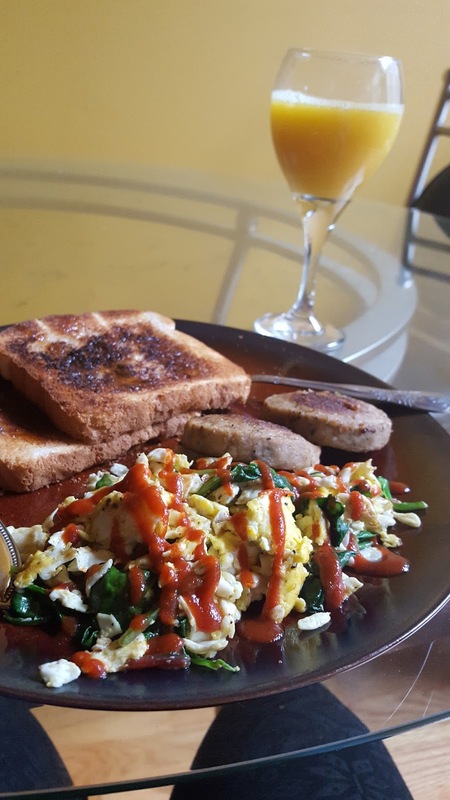 Scrambled eggs with spinach & sriracha, sausages, toast, and a mimosa! Alright, on to some lunch favorites! Basically, I always eat salads at home for lunch lol. It's what I love and it's healthy. 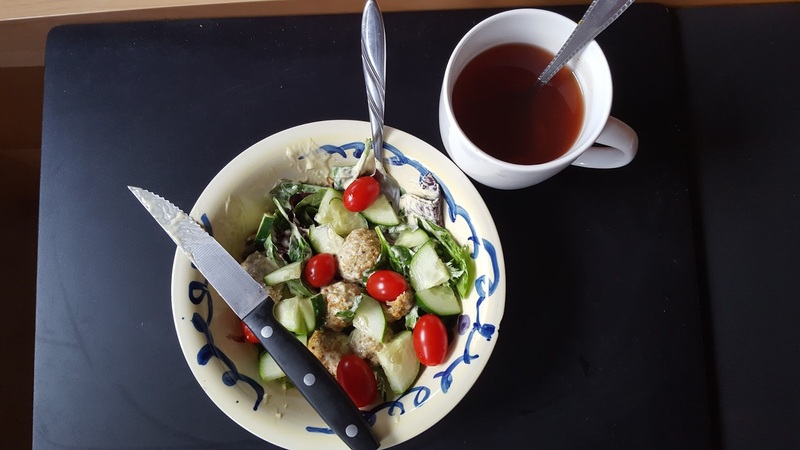 Spinach & kale, cucumber, cherry tomatoes and meatballs. I don't usually have tea with lunch, but this day I did. It's lemon zinger tea. Right now my favorite dressing is a combination of Greek dressing with ranch. Sounds crazy, but just try it. It's so goooood. 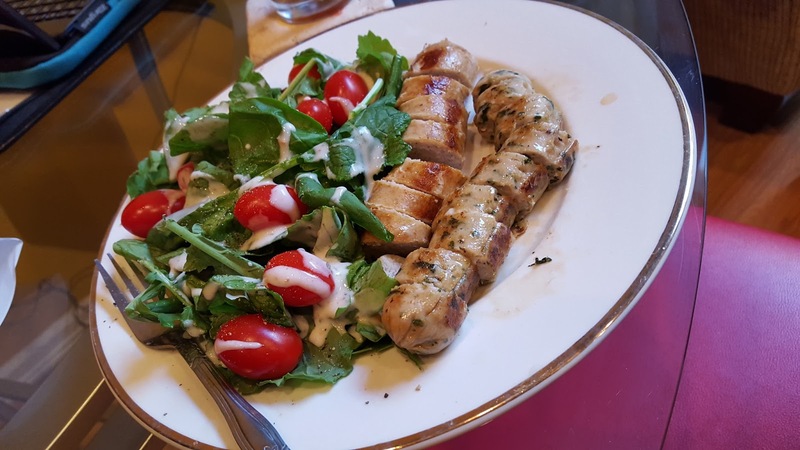 Spinach & kale, tomatoes, and chicken sausage. For dinner, I usually have something I find comforting. Here's two yummy examples. 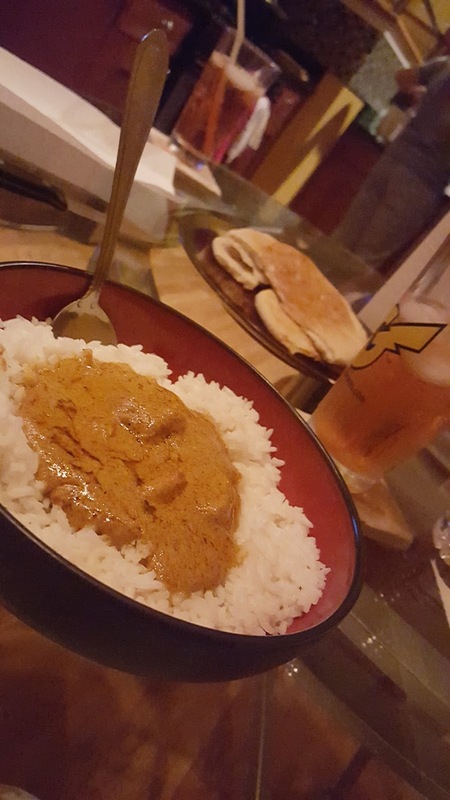 Butter chicken, steamed rice, with baked pita bread. And also, for whatever reason, I'm having iced tea. I promise I don't always drink tea lollllll. 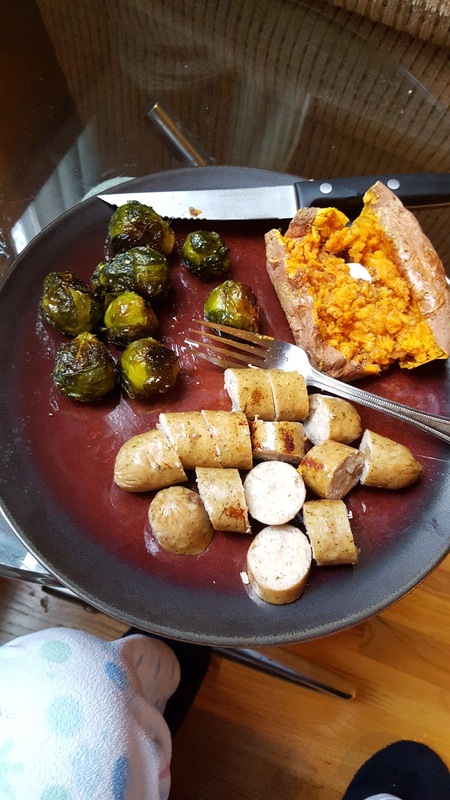 Chicken apple sausage, baked brussell sprouts (with olive oil, salt & pepper), and a baked sweet potato. "Fooood, glorious fooooood. Eat right through the menu!" lol! That's it! I hope perhaps you found some of this to be useful or helpful. See you tomorrow for Day 3 of BLOGmas! !